The American Council on Education (ACE) announced this week that UMBC’s Tyson King-Meadows, associate dean for research and college affairs in the College of Arts Humanities and Social Sciences (CAHSS), has been selected as a 2019-2020 ACE Fellow. King-Meadows will join a cohort of thirty-nine fellows from institutions across the United States in the distinguished education leadership program. Established in 1965, the ACE Fellows Program is designed to strengthen institutions and leadership in American higher education. The program identifies and prepares faculty and staff for senior positions in college and university administration through its distinctive and intensive nominator-driven, cohort-based mentorship model. “I am excited and grateful for this opportunity to further deepen my leadership skills and goals,” says King-Meadows, thanking his nominator, President Freeman Hrabowski, whom he has worked with on leadership and diversity initiatives that support UMBC’s vision and values. The fellowship affords King-Meadows the opportunity to shadow a president or provost to prepare him for the complexities of leading an institution of higher education. Over the course of a year, each cohort member will be able to observe and learn from top leaders in higher education as they manage crises, connect with donors, understand curriculum in different fields, and engage with stakeholders across their university communities. The fellowship will also provide King-Meadows insight into areas of personal interest, like faculty development, strategic planning, external partnerships, and research infrastructure. King-Meadows feels UMBC strengthens the relationship between research and teaching through engaged scholarship and applied learning opportunities through the Shriver Center and Career Center. He also wants to further bolster that connection by learning from the approaches of other institutions. During his sixteen years at UMBC, King-Meadows has served in several key leadership roles within CAHSS and across the university. He has led as co-chair of the Provost’s Executive Committee for the Recruitment, Retention, and Advancement of Underrepresented Minority Faculty and chair of the department of Africana studies. He is also an affiliate faculty member in the School of Public Policy, the department of Africana studies, and the language, literacy, and culture doctoral program. 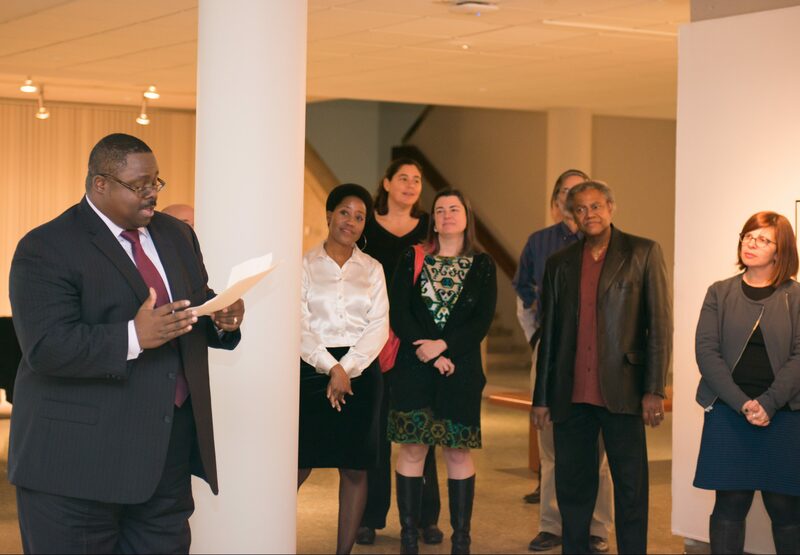 Tyson King-Meadows speaks at a welcome reception for the 2015-2017 cohort of Postdoctoral Fellows for Faculty Diversity. In addition to being recognized for his support of faculty and students in the social sciences and the humanities, King-Meadows is also an esteemed scholar. His scholarship has been supported by the National Science Foundation, Congressional Fellowship Program of the American Political Science Association, Ford Foundation Postdoctoral Fellowship Program, and U.S. Fulbright Scholar Program. Over the last fifty years, more than 2,000 higher education leaders have participated in the ACE Fellows Program. Eighty percent of ACE Fellows have gone on to serve as senior leaders of colleges and universities. Along with highly acclaimed faculty from other institutions, King-Meadows joins a respected group of UMBC scholars who have participated in the ACE Fellows Program. UMBC’s ACE alumni include Sarah J. Shin, associate provost for academic affairs; Marie desJardins, former professor of computer science and associate dean for academic affairs, who is now a dean at Simmons College; Julie Ross, former dean of the College of Engineering and Information Technology, who is now a dean at Virginia Tech; and Anne Brodsky, associate dean of CAHSS, and chair and professor of psychology. Like faculty before him, King-Meadows plans to use the strategies and techniques he learns as an ACE Fellow to further support the implementation of UMBC’s strategic plan and advance UMBC’s vision to connect innovative teaching and learning, research across disciplines, and civic engagement. Banner image: Tyson King-Meadows. All images by Marlayna Demond ’11 for UMBC.